Our reason for travelling high onto the pampas west of Lake Titicaca is to visit the Colca Canyon, where we had planned a three day trek in and out of one of the deepest sections. We were picked up for our bus ride across the mountains from Puno to the Colca Canyon at 6am. It transpired that we were the only passengers on a 40 seater coach, so we got to chat with Leonandro our Argentinan guide, and who as it happens worked in the hostel for which we are destined this evening. On the way to Colca we pass Lagmillas, the largest source of drinking water on the entire altiplano. The landscape here is vast and arid looking, punctuated by volcanoes both extinct and active. Seriously high as well, over 4,400m at this lookout. Sadly the beauty of the place is tarnished by the presence of the mining industry here. Many minerals are extracted from this beautiful landscape and driven out on long convoys of dump trucks bound for the city of Juliaca, the crossroad for all of Peru’s haulage and trade. The bus dropped us off in Chivay where we had lunch overlooking the main square, a small but bustling little town. A long queue for the bus to Cabanaconde persuaded us to opt for a collectivo down into the Canyon. Collectivo is a term used for a kind of shared taxi that often hang around bus stations looking for overflow from the mainstream services. If the drivers get their seats filled quickly, you can be on your way ahead of the buses and often arrive sooner. The drive through the upper canyon was stunning, very wide and relatively shallow at this point there was a very pastoral almost Ribble Valley-like feel to the place. This was quickly replaced by clouds around the high peaks of mountains surrounding Cabanaconde. The last day of the annual Festival of the Virgin was well underway when we arrived in Cabanaconde. The locals dress ostentatiously and dance in the main plaza for hours on end, fuelled by beer and repetitive brass band music, but think more carnival than colliery! The first twenty minutes was interesting to watch then the event took on a bizarre turn for us outsiders, as people continued in the same limited and repetitive motions for hours on end. With in house pizza oven, Pachamama Hostel was a no-brainer for our pre-trek dinner! We set off at 7am so as to avoid the heat of the day, which combined with the altitude here can be brutal. The first hour along the ridgeline was spent in deep fog, robbing us of the wide open views for which the canyon is renowned. We soon dropped down below the mist and got our first views of the canyon. As the Sun rose higher the mist was burnt away to reveal the full scale of the canyon beyond. The residual haze gave the distant mountains a purple glow that my photography skills failed miserably to capture. So many colours and points to look at, we took our time on this first stage of the descent. As we rounded a rocky spur, a condor swooped no more than 10m above our heads on its morning patrol of the ridgeline. I only just got a picture before it disappeared behind the cliff top. Despite having quite ungainly turkey-shaped heads and not being the most beautiful large bird in the world, they are majestic and effortless in flight. The next phase of the trail was steep, unstable and monotonous so we were relieved to reach the valley floor. Both of us had some excellent ‘wind down the windows’ moments when the path repeatedly gave way beneath our feet. Once at the base of the canyon we crossed the Rio Colca and walked up the steadily rising road towards Llahuar lodge. We were stopped briefly by a sudden rockfall but Rose recovered quickly (all the body pump sessions came into their own). We crested a spur and there below us, perched on a cliff side above the Rio Molloco sat Llahuar Lodge, looking more like a Tibetan monastery than a rest stop for hikers. Crossing the river we quickly settled in for an afternoon of paddling in the river below the Lodge. Closely followed by my valiant defeat at chess while sat in the rough and ready main lodge that teeters over a cactus field. We shared the thirty room lodge with a rock-climbing couple from Saint-Etienne, France. You’ve got to love the low season! We hiked up out of the Llahuar area of the canyon through the villages of Paclla and Belen. The terraces surrounding the villages are planted densely with cacti that grow plump looking fruit along the edges of their chunky leaves. A bit different to the orchards we’re used to seeing back home. The canyon is stunning, but we couldn’t help draw comparisons with the Italian Alps. It seems that no matter how far you travel, you always take yourself and your own points of reference with you. To overcome this prejudice is nigh on impossible. Really, it should be enjoyed as it means your experience of a place will always be slightly different to the next person’s. The hard climbing of the day was done and dusted in two hours or so, and we meandered our way east in the direction of Mirador Apacheta. The view out this way is different to the Llahuar area, with slightly steeper and more fertile slopes here and a canyon that follows a straight trajectory off into the hazy distance. The Oasis de Sangalle can be seen nestling in the bottom of the canyon. We sat for a break before descending down to the Oasis de Sangalle in the very base of the steep canyon via the town of Malata. As we neared Sangalle and crossed the final rope bridge of the day a waterfall poured non-stop out of the canyon wall with no visible source. This explains the title of ‘oasis’. Sangalle receives a huge amount of fresh water from deep underground, to the point where they can run electricity generators and artificial waterfalls down here. The oasis is relatively close to the town of Cabanaconde and is packed with trekkers in the high season. I’m not sure if I can and should keep referring to these bits of the trip as ‘treks,’ when I am now sat beside a glistening Hockney-esque swimming pool – complete with false waterfall – among verdant flowerbeds, hummingbirds and dragonflies with our private ensuite bedroom only metres away. It feels far too cushy. After another early and hearty breakfast we set off up the long climb back to Cabanaconde. Mercifully, high cloud clung to the rim of the canyon shielding us from the early morning sun but sadly this didn't alter the gradient much! We climbed steadily and we took regular breaks to enjoy the ever changing views as we got higher and higher. The path snaked in and out of cliffs and we finished at 3,300m above sea level having started at 2,100m in Sangalle. A total climb of 1,200m at altitude stands us in good stead for the Inca Trail in a couple of weeks time, where this kind of ascent is the bread and butter. While it is obviously possible to go much higher in this region (some of the volcanoes top out over 6,000m), we noticed a marked difference from the climbs we did in Patagonia at sea level. Altitude not to be sniffed at I'd say! The early starts on each day of the trek allowed us to get the climbing done early and relax in the afternoons, making the trip enjoyable in multiple ways. All done, and back to Pachamama to collect our bags and some delicious sandwiches before the tiresome eight hour bus to Arequipa where we have some serious R&R lined up! 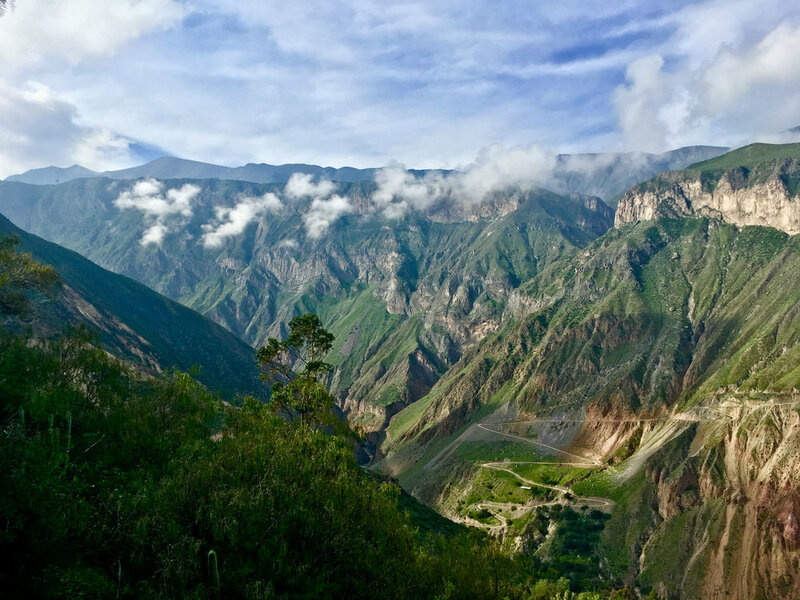 I recommend that the Colca Canyon sits high on everyone’s to-do list when visiting Peru. A stunning landscape and great people. Going in the off season was the best part, as we had the trails and the hostels largely to ourselves. Booking direct with hostels and tours was the best way for us to guarantee that our money went straight into the local economy.